Let the fun begin! Here are some wedding decoration ideas that will help you start planning the look and feel of your wedding. When you plan your wedding, there are many things to take into consideration. Not only when will it be, but, where? This is perhaps the most important of all the questions. After setting your date, you will need to decide where you would like the wedding reception to take place. Once you know this you can start to put together your wedding decoration ideas. 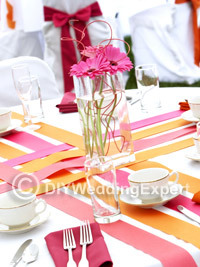 If you choose to have your wedding at a professional catering site, then, decorating it will be minimal for you. They will most likely have their own decor for weddings and you may only need to add a few personal touches. However, if you are planning your wedding at a smaller venue, say a firehouse or rental hall, then, decorating will need to be done. You can make any place look great if you use your imagination and take some of the wedding decoration ideas below. Your wedding can be unique to you and exactly as you have always imagined it would be. 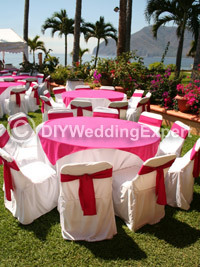 The color scheme of your wedding should follow from the bridesmaids dresses all the way to the table linens. You will want to match the colors as closely as possible. Variations and shades of a color can work, such as, bridesmaids dresses in navy blue and table linens in sky blue. The blues could also be the same shading. This same color scheme should be included in your centerpieces. If you make them yourself, consider doing something with ribbon intertwined in flowers to match your color. The same holds true for the napkins you will be using. It is imperative that the napkins match the tablecloths. Many people believe that at a wedding the only type of flowers used should be real. This is not necessarily true since silk flowers come in such a large variety of types and colors that artificial flowers are sometimes your best choice. Whether you go with real flowers or silk, again, the coloring should match with your overall color scheme. Even if you choose to have white roses against the above example of navy blue, this combination is beautiful and will look exquisite at your wedding. Get advice from friends and family as you start to develop your wedding decoration ideas, they may be add ideas you hadn’t thought of. If your personal decorating style is retro – having a modern minimalist wedding is not for you. Your wedding, in all aspects, should match your personal sense of style. Since vintage is such a big thing right now, try using soft colors all over the room and perhaps having a very large teacup as a centerpiece filled with old fashioned flowers. This will not only be gorgeous, it will give all of your guests that vintage feel. Typical Victorian weddings are elegant affairs. Try decorating with a lot of lace throughout the room (perhaps lace tablecloths). Your centerpieces of flowers can be made in beautiful vases with pearls and lace worked into them. You can search online for many wedding decoration ideas and suggestions for your wedding.